Bit of a downer really, but, if you love the series then I'd still get the book, because if there is a book 12 then you'll be left behind in the storyline, like I said, this book seemed to lay the groundwork for the next book. So, I hate to be the bearer of bad news and I can only imagine the hours the Mrs. Harris put into this one! I love the southern vampire (sookie) series, but for some reason I can't really relate to Sookie in this one. Reading this is seeming more and more like homework. The way Mrs. Harris is laying the foundation for the Sookie-Sam relationship felt forced to me. So much so, that I still can't finish the book! The book begins with constant references to how good Sam is, how Sookie would like to brush his hair, how he defends her, helps her... I don't know, it's making Sam seem even more boring (maybe she should just keep him as a pet). I suppose Sookie will eventually see the light and realize that she has been in love with Sam the whole time. Snore. I put down 3 stars as a start. As I read I'm taking away or adding stars. Don't hold your breath, though. It's taking me longer than usual to finish this one. BTW. Miss Parker did well, as always. I love this series and I was really looking forward to this latest installment, but I found this book lacked something. 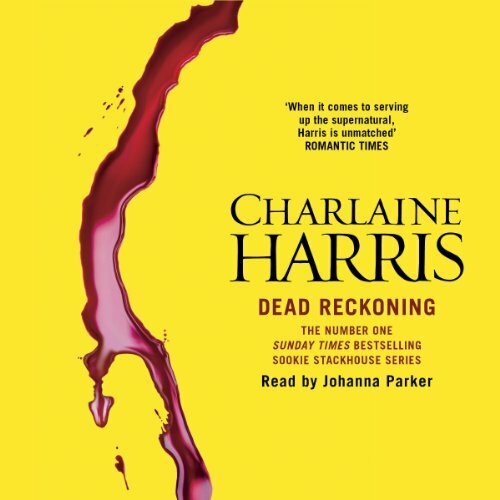 I had heard this would be one of the last Sookie Stackhouse books and I was hoping that Harris would begin to offer some conclusions to Sookie's story. Instead, the books conclusion is frustratingly ambiguous. I really hope there is another book in the pipeline, Sookie deserves to go out with a bang not parked on the couch watching jeopardy. This book was another great addition to the series. I so love the True Blood series. Hope there is many more to come!! Wie alle voherigen Bücher dieser Serie ist auch dieses beste Unterhaltung und man möchte am liebsten sofort das nächste. Johanna Parker ist eine unglaublich gute Sprecherin. Sehr klare und deutliche Aussprache mit interresantem Südstaaten Akkzent. für die Romatiker unter den Fans mag die ein oder andere Entwicklung etwas enttäuschen, ich finde da Buch dennoch sehr gelungen und freue mich schon auf das nächste. Johanna Parker ist eine tolle Sprecherin !!!! Da es immer so lange dauert bis die Bücher in deutscher Sprache erhältlich sind bin ich auf die ungekürzten Hörbücher umgestiegen. Ich bin begeistert!!! Johanna Parker liest gut und dem südlichen Akzent angepasst. Man hört sich nach ein paar Minuten problemlos rein. Ich würde mir zwar wünschen, sie würde Sookie nicht so quietschig darstellen, aber sonst ist es eine sehr gute Unterhaltung. Ich freue mich auf weitere (Hör)Bücher dieser Serie! !